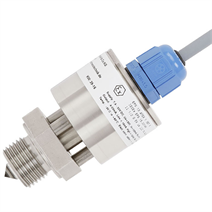 The model OLS-C51 optoelectronic level switch is used for monitoring the level of liquids. The optoelectronic sensor consists of an infrared LED and a light receptor. The light from the LED is directed at a prism which forms the tip of the sensor. So long as the tip is not immersed in liquid, the light is reflected within the prism to the receiver. When the liquid rises within the vessel and surrounds the tip, the light beam is refracted by the liquid, so that the receiver is no longer or only weakly reached by the light and reacts to this change by triggering a switching operation. As an explosion-protected version, the model OLS-C51 level switch is designed for medium temperatures up to +135 °C in zone 0 and 1.